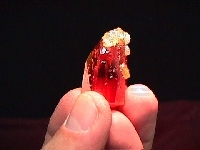 Zincite that most people are familiar with, was said to have been grown by accident in the smoke stack of a manufacturing facility of zinc-based paint in Poland. It is Zinc Oxide and the zinc that had become gaseous during the manufacturing process combined with oxygen and cooled, formed brightly colored, mostly orange, red and yellow crystals within the smoke stack. 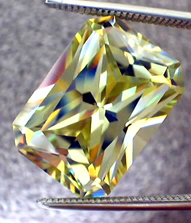 This brightly colored material has a high dispersion, giving flashes of different colors much like that of diamond. 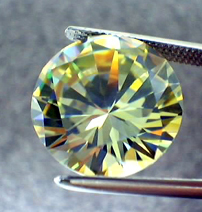 Though it is soft, it can still be used in jewelry, but should be worn in pendants, pins and earrings, rather than rings. 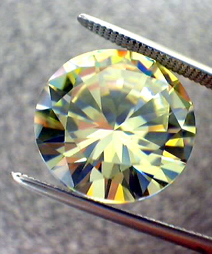 We have some of this brightly colored material faceted(ovals, emerald cuts, etc), as well as in the rough. 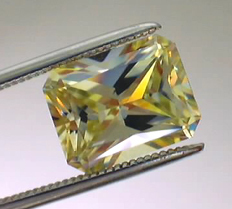 Price is based on size and color - with usually the larger pieces being less per carat. 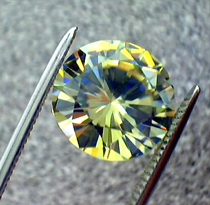 All pieces are well cut and clean. See photos below for available stones. 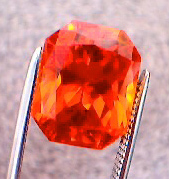 To learn more about Zincite - visit the All That Glitters Zincite Page after viewing our inventory! 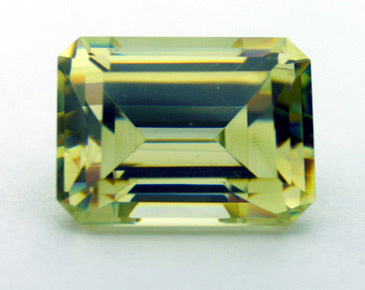 Yellow to Greenish Yellow Zincite - Light to Medium Yellowish with a hint of Green in the deeper stones. 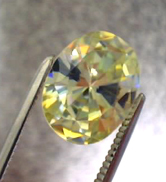 Very Dispersive, more so than Diamond! 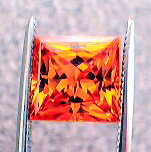 Bright, lively with all kinds of colors leaping from internally within the gem. 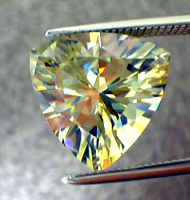 Unlike anything we have seen before in this material!....Faceted Zincite of decent size, fine quality faceting, clean material is difficult to find. 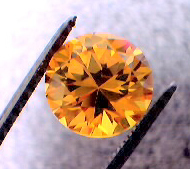 We know of no other companies currently with Zincite which falls into this category, other than ourselves and again, we have never seen this unique color either. 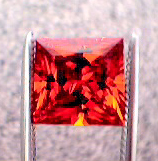 Note that the size of the gemstone as it appears in the photograph does not indicate relative size to other photos displayed. For those seeking matched pairs of any particular size, please feel free to send us an email to make an inquiry. Many of the pieces below have a match! Another similar size is available after this one sells. Another two similar sizes are available after this one sells. 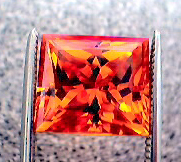 4.16ct Radiant 9x7 $175 Availabliity? 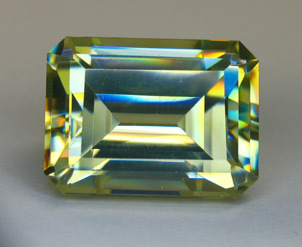 Below are two photographs of a wonderful naturally terminated rough crystal - Will also faceted some nice gems! For those working with or wearing Zincite (Hardness is approximately 4.5), the precautions below will insure the integrity of the stone. DO NOT set the stone on a dirty surface, as dragging it through metal scrapings will cause scratches - Be careful in setting the stone as it is a softer stone. 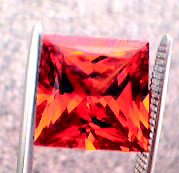 DO NOT wear Zincite in a ring - it is best suited for a pendant, pin, enhancer, earrings, etc. DO NOT clean with anything other than just water (and possibly a very mild soap). Ammonia and even perhaps alcohol could cause pitting or a change of the surface affecting the appearance. Follow the rules for Jewelers/Goldsmiths above. 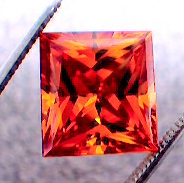 "I have had my zincite for several days, but it always takes me a little while to get a thorough look. 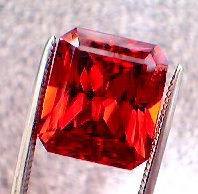 I am delighted with the gem you selected! 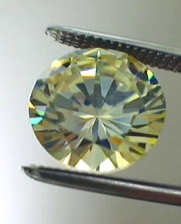 My wife even thought it was something special and compared it to some light yellow diamonds we have seen! 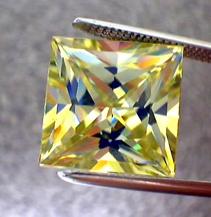 I think it has a wonderful "gemmy" clarity, and the cutting seems really well done. What a delight to receive." 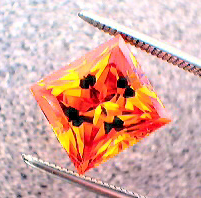 "The zincite is so unique!... 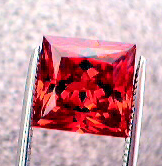 Thank you for such an interesting stone to work with, I love collecting the unique." 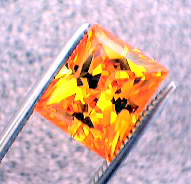 "I received the zincite today-- I'd been out of town for Christmas ...and couldn't have asked for a nicer surprise when I unwrapped the stone. 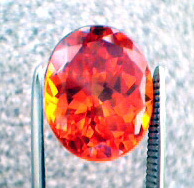 It is all you said it was and more-- the color, the quality of the cutting, the personality of the stone, all are excellent. I look forward to doing business with you again soon." 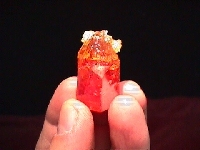 "I just received the Zincite & owahee jasper. 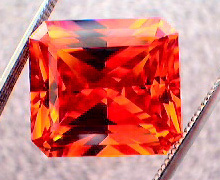 I am very happy with the jasper and -- TOTALLY blown away by the EXCELLENT color and brillance of the Zincite. 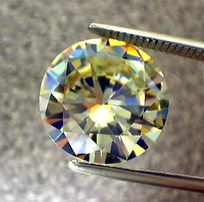 I will be telling my lapidary and custom jeweler friends about ALL THAT GLITTERS. 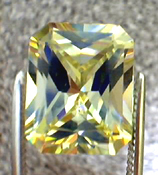 I also have a few friends who only wear custom made jewelry who I will be telling about A.T.G. 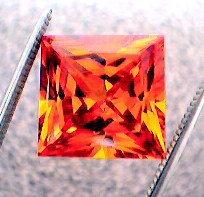 I will definately be interested in the Elegante cut Zincite in about 3 months"